There are many versions of borscht, generally a beetroot soup seasoned with dill. 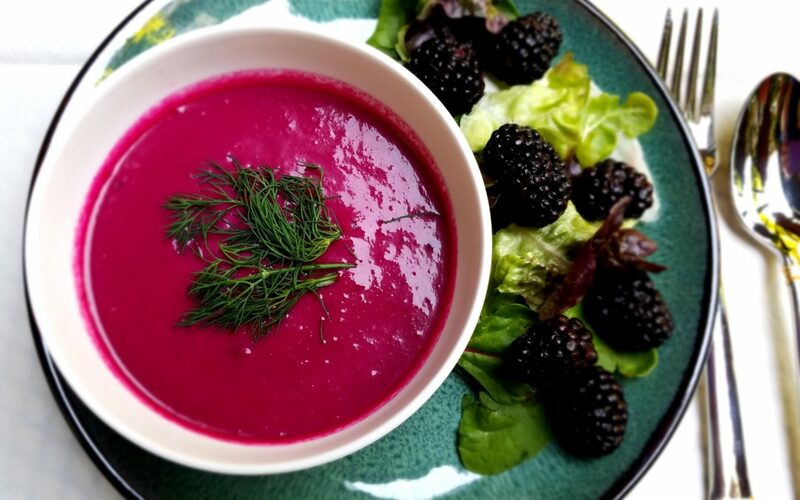 This recipe changes things up a bit, using what may seem like an unusual combination of ingredients – beets, blackberries, cucumber and coconut milk. Packed with vitamins, minerals and anti-oxidants, the result is a light and refreshing cold soup that tantalizes the taste buds and nourishes on a hot day. Serve it in “shooter” glasses as an appetizer or in small bowls alongside a salad for an eye-catching summer meal. Be sure to take the time to chill it for at least 4 hours before serving so the flavors completely blend and develop. It is even better if made one day ahead. The chilled soup will last up to one week in the refrigerator. Preheat oven to 425° F. Line a baking dish or pan with parchment paper or foil. Peel the beets and cut into 1-inch cubes. In a large mixing bowl, toss the beets with 1 tablespoon avocado oil. Spread the beets in a single layer in the prepared baking dish, place into the oven and roast for 15 – 25 minutes, until just soft when poked with a knife or fork. Remove from oven and set aside. In a large stock pot, heat the olive oil or ghee over medium heat. Add the chopped leeks and sauté until just softening, about 2 minutes. Add the garlic and continue to sauté 30 seconds more. Add the broth and roasted beets to the pot, bring to a low boil; reduce the heat, cover and simmer for 30 minutes. Stir in the coconut milk until fully combined. Cool the soup to room temperature, then refrigerate for at least 4 hours before serving. When ready to serve, garnish as desired using diced beets, dill sprigs, blackberries, diced avocado, or a drizzle of extra virgin olive oil.